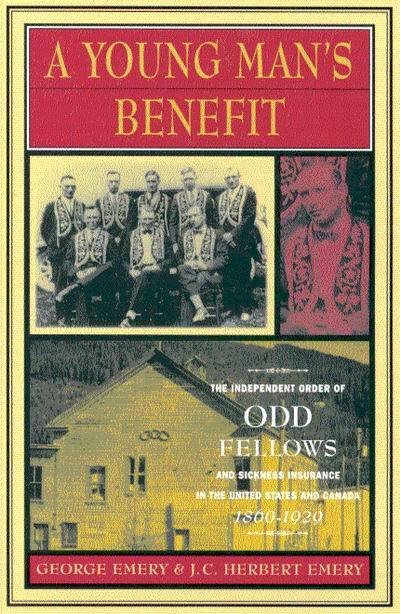 (Editor’s Note: If you would like to learn more about the historical context and impact of Odd Fellows member benefits see Young Man’s Benefit: The Independent Order of Odd Fellows and Sickness Insurance in the United States and Canada 1860-1929). If we look back to 1860 when Odd Fellows was beginning to grow at an enormous rate in later decades and look at the benefits that a potential member may receive, a clear picture forms as to why the order grew so quickly. Looking back, it’s easy to see why the order admonished members to not consider the benefits primary but to focus on spreading benevolence and Odd Fellowship as a means to a better world. 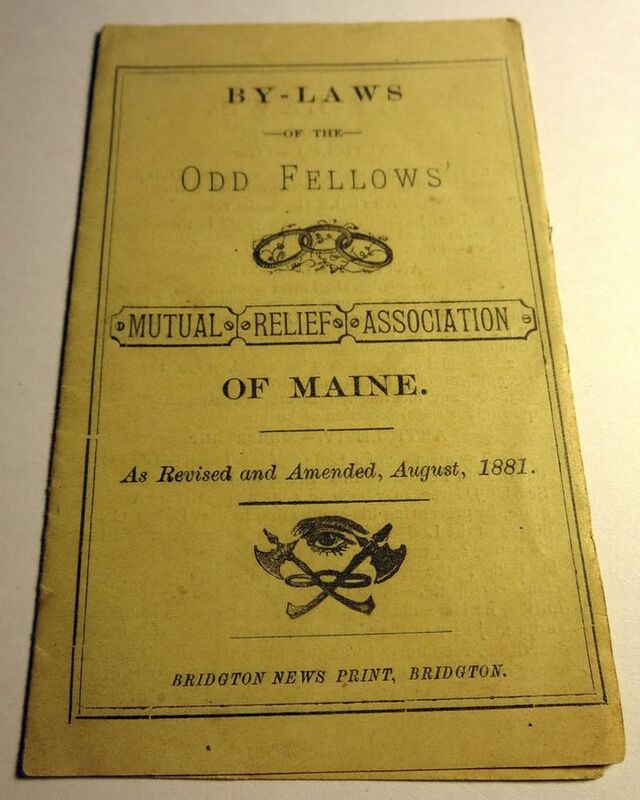 Today if you are admonished to not focus on the benefits, you may respond, “Well the benefits aren’t that great, so why admonish me?” The reason why was because, back then, those benefits were indeed generous and certainly a great reason for people to join Odd Fellows. In 1860, if you were a sick Odd Fellow and were stuck resting in bed, members were called upon to provide aid as a nurse would do and a nurse would typically be paid $16 a day. That’s $459 a day in today’s money. What do we offer members today if they are recuperating? Hopefully they have AFLAC. And, in 1860, if you were an Odd Fellow traveling and needed emergency healthcare or if you were in financial distress and a local lodge was contacted, then someone would telegraph your lodge and verify your standing and then provide the aid you need. In your lodge, you would do the same for a travelling Odd Fellow in need. This was a big deal and big attractor back then because if you traveled and fell ill or became incapacitated then you would likely be robbed and left for dead. 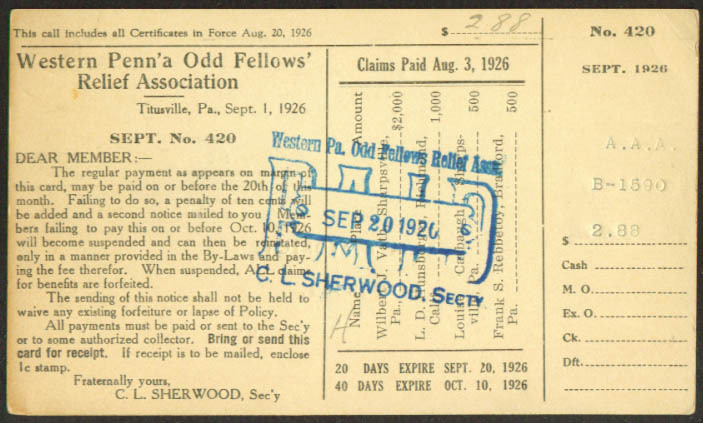 Today as an Odd Fellow you may wonder what kind of aid would be afforded to you if you were traveling to a state where Odd Fellows is no longer quite as active. And even if your lodge is active, it’s not like someone is sitting there waiting for a phone call to confirm your standing. The benefits of 1860 read much like the kind of mutual aid benefits that one would find from Mutual of Omaha. This kind of mutual insurance company is owned by its policy holders and profits are retained within the company (to either drive down the cost or expand benefits). Doesn’t this sound a lot like the Odd Fellows of old? It’s no wonder that Mutual of Omaha was started in 1909 as an alternative to Odd Fellows for those who could not or would not join a secret order. The number of members of secret societies were in the millions and counted 1 to 2 out of every 5 men and women so what did the others do for mutual aid? Mutual of Omaha is an excellent example of what Odd Fellows could be today in terms of benefits. Wouldn’t people be more interested in Odd Fellows if they knew we had great insurance like some companies are attractive because of their health insurance packages? If you look at the benefits offered by today’s Oddfellows in the UK https://www.oddfellows.co.uk/benefits/, they have dental and optical and legal aid along with the UK public health insurance paid for by taxes. It is very informative to see how they have changed with the times to continue the tradition of being an attractive mutual benefit society by offering things that we do not. Do you think they would offer health insurance if there was no “social medicine” provided by their government? In all “get out of town” seriousness, the IOOF gave $951,556 in aid in 1869 according to their 50th anniversary announcement and that amount is equivalent to $16,761,221 today. The $50 funeral benefit in 1860 is worth $1,435 today. The amount they paid to widows of members in good standing is more than what a widow today would receive on cheap insurance. And all this was before Odd Fellows had yet to reach its peak in terms of membership and, indeed, very likely it was the reason Odd Fellows grew to be so large. It was a safety net that was solid then but today is a patchwork of aid–not the kind of security you get from a great health insurance policy. I think it’s clear that the better the benefits that more giving becomes possible. When the benefits are attractive, there are more members and more money to do things like build gigantic orphan homes. The Odd Fellows for several reasons including declining membership haven’t built any gigantic orphan homes; but also there is no new gigantic homes because of the myriad of alternative non-profits and the American social welfare system which were ushered in by an Odd Fellow (Social Security). Yes, our government has supplanted many of those benefits from the 1800’s but it’s not a great safety net. Social medicine wasn’t implemented here like in the UK, so the safety net is not as good here as it is in the UK. But aren’t some lodges growing even without better benefits? Yes; and if we look at lodges that have had an increase in membership, they focus more on volunteerism or the social aspect and that’s fantastic, admirable and should be emulated everywhere. But with Facebook cheapening what it means to be “friends” and the slow speed at which we can become known in social circles as a great place to volunteer or be social isn’t going to save lodges from closing unless each lodge gains one or two or more dynamic individuals who are not just always friendly but always inviting. Comparatively, we don’t have the recognition of the American Red Cross, the Peace Corps, Meals on Wheels, etc., so how can we be known for how great we are when people don’t recognize our name? We need a transformation and we need it fast. Yes, we should look beyond the benefits when it comes to Odd Fellows but if we want to have people to admonish to look beyond the benefits, then we need to have very attractive benefits because they used to be a big draw and led to incredible growth and they just aren’t so great anymore. In adjusting today’s dollars with what was spent on benefits back then, we need to become something like “Mutual of Odd Fellows” and literally be set up just like any mutual insurance company where they offer health insurance and other types of insurance and benefits. Yes, this would probably mean we would need to raise our annual fees, but what do people spend now on insurance? If you look at California’s early Odd Fellows, it cost $50 in 1849 to become a member and $10 every quarter. In today’s money that’s $1572 to join and $314 four times a year. And if we were to become “Mutual of Odd Fellows” and offer real health insurance, people would be excited to pay $1,248 a year for insurance. I would! There are people reading this right now that pay $1,248 a month for health insurance already. If we did what the Odd Fellows of 1849/1860/1869 did and build a safety net like they had, we would have an increase in membership like we have not seen since then. Our past will save our future. Thank you for the post. Thought provoking for sure. Certainly, a similar purpose with a modern model could be built. Interesting, the 1869 article points to 3,195 lodges which means 3,195 branch claims offices to administer the relief back then. Accdg history book about SF Odd Fellows by Peter V Sellars, the Social Security System was started by Odd Fellow FDR who introduced the idea of mutual benefits to the general public. Thank you Ainslie for adding some great relevant graphics.